Dog bakery supplies include special dog cake mixes, dog cake pans with themes and shapes designed for dogs, dog bone cookie cutters, other dog themed cookie cutters, decorations for dog treats, dog treat frosting mixes, packaging supplies and packaging decorations, and other products that dog bakeries and dog treat businesses use to create their dog treats, dog cakes, dog gifts and dog gift baskets. This silicone dog bone cake pan is just one of many dog themed cake pans you can use to bake cakes and treats. Dog birthday cakes are very big sellers. Pet parents love to celebrate their fur baby's birthday. As dogs are becoming humanized and filling in the gap for empty nesters and easing the loneliness of those who live alone, demand for these items is sky-rocketing. These businesses buy these products in bulk and at wholesale prices. They make large quantities of cakes and treats. There are other businesses that can be found on the internet that advertise themselves as such. Some of them do sell a few appropriate supply items. Because I do a lot of baking, and I have a qualifying business, I signed up for wholesale pricing. But I am buying a lot of product! They also have retail pricing which is more in line with these other companies selling smaller items. Most of my recipes are based on products that I can only find through them. 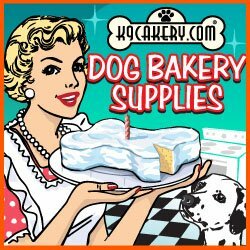 They have a huge selection of all natural cake and biscuit mixes plus the easiest to use dog treat frosting that I have come across! They ship immediately and are courteous and always willing to help. I understand that some of the largest dog bakeries buy their supplies here. So, if you are planning to get into the business, or plan to make quantities of dog treats, please keep this information in mind.